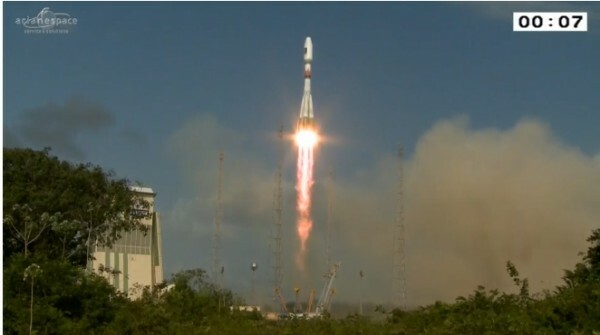 With 12 successful launches over 12 months, Arianespace’s mission performance in 2015 was one for the record book – concluding with today’s Soyuz flight that further expanded the European Galileo global navigation satellite system. Ascending from the Spaceport at precisely 8:51 a.m. local time in French Guiana, the medium-lift vehicle performed a mission of nearly 3 hours and 48 minutes to deploy its two Galileo FOC (Full Operational Capability) satellite passengers – which are the constellation’s 11th and 12th spacecraft to be orbited to date. After an initial powered phase of Soyuz’ three lower stages, the flight – designated VS13 in Arianespace’s numbering system – included two burns of the Fregat upper stage, separated by a three-plus-hour ballistic phase, to place the two satellites at their targeted deployment point. At full capability, the Galileo program – supported by Arianespace launches – will provide a European-operated navigation system to deliver highly accurate global positioning services through a satellite constellation in medium-Earth orbit and its associated ground infrastructure. The European Commission is funding and executing Galileo’s FOC phase, with the European Space Agency (ESA) designated as the system’s development and sourcing agent. Prime contractor OHB System in Bremen, Germany produced the satellites, and their onboard payloads are supplied by UK-based Surrey Satellite Technology Limited (SSTL). Flight VS13’s success continues the key role of Arianespace – as well as Soyuz – in Galileo’s development. The medium-lift workhorse lofted a total of four satellites in the program’s IOV (In-Orbit Validation) phase in 2011 and 2012; plus the first eight FOC spacecraft on four separate missions – including today’s – performed over the past two years. The Galileo system will be further expanded next year on an Ariane 5 mission that will carry four more satellites – with half of the constellation to be deployed at this point – followed in 2017-2018 with two additional flights using Ariane 5s, plus one with Soyuz.